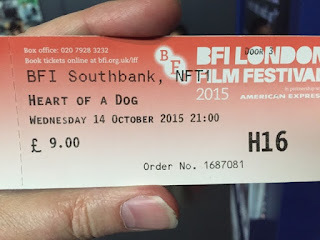 Last week I went to see the new Laurie Anderson film Heart of a Dog at the BFI as part of the London Film Festival on London's glitzy South Bank. Ostensibly about her late beloved piano-playing and finger-painting dog Lolabelle the film expands to be a meditation on loss - contemplation on death, loss of memory and how stories evolve, and the loss of freedoms following the events in downtown New York on 9/11. Many of the stories have been presented in Anderson's other current productions such as Lolabelle being attacked by hawks and the parallels with the look on the faces of New Yorkers when they too realised that the threat could come from above. A moving and very personal film. Love her. Loved the film.